Acragage® Pressure Gauge Options | Texas Valves & Instruments, LLC. This optional Acragage feature provides for completely purging all air from the Bourdon tube in sealed systems or in solid-filled gauges, (such as those with diaphragm-type chemical attachments). The removal of all air allows the gauge to function accurately, without spongy or sluggish action. This is extremely important on chemical gauges in low pressure ranges where diaphragm effect must be minimized, or in high pressure ranges where diaphragm travel is limited. The Capillary Bleeder also permits thorough flushing of test gauges (or other gauges) when changing media. It is often used for continuous or intermittent purging of the Bourdon tube with a liquid to prevent the pressure medium from clogging the tube. Capillary Bleeders are available in 1500, 1600, and 1700 series and fluid filled gauges only. Standard Construction: The bleeder valve extends through the side wall of the gauge case, thereby providing convenient access for purging. Designate "J" in Table VIII - Options on the Model Selection Chart - Gauges. Shockstop is an internally mounted mechanism that absorbs the shock of sudden line surges, thus preventing damage to sensitive gear parts and stabilizing the pointer for easier reading. The mechanism consists of a Delrin coated movement disc, attached at the end of the pointer shaft, rotating in a sealed cylinder of silicone fluid. The resistance of the fluid slows disc rotation to permit gentle pointer movement and a more accurate reading. There are no snubbers or orifices to clog up and cause incorrect readings. This movement lasts up to 10 times longer than stainless steel movement. (Tests show no appreciable wear after 22,000,000 cycles). All major wear points are made of self-lubricating Delrin, which is dimensionally stable, corrosion-resistant, and provides frictionless operation. Delrin Movement is standard on "Shockstop" Movement and is optional on any series 1500, 1600, 1700 and 1800 gauge for minimal additional cost. Designate "Q" in Table VIII - Options on the Model Selection Chart - Gauges. Virtually all types of chemical protectors and diaphragm seals are available options on most gauges. 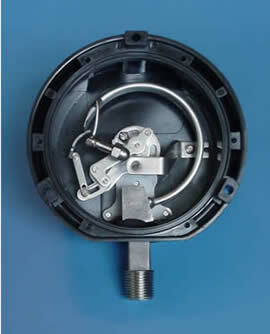 This standard Acragage movement is designed for general plant service, and is recommended in the majority of applications. With top and bottom plates of 302 stainless steel, and other parts of 303 stainless, it provides maximum resistance to corrosion for years of trouble-free service. This gauge is constructed similar to the standard bronze tube gauge (Series 1500) but with a double-scale graduated in psi and equivalent feet of water. Typical applications include open hot water heating systems, reservoirs, water tanks, and similar installations. For dial ranges available, see Table VII on the Model Selection Chart - Gauges. This gauge utilizes a standard Bourdon tube, and is designed for use with refrigerants with suitable bourdon tube material. It features a double scale dial graduated in psi and vacuum, with an equivalent temperature in Fahrenheit. This 1500 Series Process gauge is available in a 4.5" or 6" case. A 300 Series Refrigeration Gauge is available with a 2.5" face, (see General Equipment Gauges - Refrigeration Gauge).